I remember when I first met Mohamed. He first came to track practice sometime in the middle of the season, having never run competitively in his life before. I asked him where he was from--he responded that he was from New York. With his accent, I couldn't imagine that was all there was to him. So I asked where he was originally from. "Sierra Leone," he replied. I can assure you, I'm certainly no geography guru, but by spare chance, I happened to remember reading about the civil war and the diamond conflict, and in the back of my mind, I recalled looking over some pictures from the Kono District. Mohamed was nearly in shock when I mentioned Kono, and it just so happened that his family did in fact hail from a village in Kono. During practice, we ran through our workout as usual. As we neared the conclusion of our sprints, I saw Mohamed on the other side of the track, writhing in pain--cramps or something of the sort. Feeling rather guilty for my being slightly amused by this, I went over to see if he was okay. I reminded him to stretch and apply ice, and suggested he avoid eating too close to practice. After an eventful first day of practice, I didn't really expect to see Mohamed stick around for long, but he sure as hell proved me wrong. He stuck by the sport giving it everything he had, seldom missing a workout, and always seen with a grin from ear-to-ear regardless of the weather or the workout. At our first meet, Mohamed was entered in the 800-meter run. He had no idea how to strategically run the race, and after the first 300 meters was well ahead of the pack, rapidly fatiguing and seemingly (or perhaps genuinely) unaware of the remaining 500 meters. He finished the race, and with a very respectable time for his first-ever race. We congratulated him on completing the difficult race, and through gasps for breath, he managed to squeak out a question. "That...was...fun. Do we have a...meet...tomorrow?" Track & field is a lot of things, but I've rarely heard the 800 described as a "fun race," and I'd be willing to bet that there are few runners who would willingly run two consecutive 800's. The following week was taken as rest in preparation for the Conference Championships, and Mohamed didn't qualify individually in his first meet, so he would have to sit spectator at the championship meet. But at the last minute, the need for someone to run a 400 in the Distance Medley Relay (DMR), came up, and Mohamed was suddenly in luck. He ran his leg of the race to the best of his abilities, turning in a solid time, and prepared again to run immediately after. As the outdoor season commenced, Mohamed's 400-meter time dropped, and he was soon down in the low 50s range. He would run an open 400, then less than an hour later run a leg of the 4x400 relay. I think we all thought he was a little crazy at that point. Perhaps more impressive was that there were times where his second 400 would be slightly faster than his first. I guess he was just warming up. The more I got to know Mohamed, the more I liked him. He was a character, and more than anything, he was eager to learn, and as I soon found out, came from far more adverse and abject conditions than the impression he gave when we first met. It's people like Mohamed that make you realize how fortunate you really are. To see the joyous countenance of a person who hasn't seen his parents in nearly a decade, a person who has less but is far more satisfied and effusively grateful for what opportunities he has been afforded; that makes you realize your own great fortune, and simply brightens your day. We on the track team are often apprehensively anticipating a hard run, and though we all love the sport, I've never heard of anyone who finished a half-mile sprint, and immediately ask when he would be able to run it again. People like Mohamed add a fresh and holistic perspective to life, and to do that it takes a certain talent, and a certain person;needless to say, they aren't ubiquitous in today's day and age. A few weekends ago, Mohamed came to visit me at my parents' home for the Sabbath. Though a practicer and observer of the Islamic faith, Mohamed was not only open-minded, but utterly reverent and truly interested in the Jewish customs, foods, and laws. Seldom do you ever hear of a Muslim partaking in the Jewish Sabbath, and even more rarely does it seem that that person can be completely comfortable in an environment entirely foreign and unknown. There is a reason that Mohamed is one of my best friends through thin and thick. He makes me remember how fortunate I am to have what I have, to live and enjoy life, to remind myself how great I really have it. I am certain that anyone who has been around Mohamed for even just a brief moment will be able to see how much of an impact he has on those around him, how his inexorable happiness and unfaltering smile have inspired hope in so many. At the end of the day, there are so few of us who have had a life as difficult and trying as Mohamed. Seeing the smiling face of a young man who has been away from his family for over seven years, seeing the face of a friend who has suffered through the greatest adversity, but is so determined to achieve his goals--that is what defines Mohamed, what makes him such a unique person, great friend, and inspiration to those around him. I hope I didn't mislead anyone with the rather oxymoronic title, but if you're reading this, my intentions in capturing your attention were successful. Recently, I've been searching for ways to decompress and venture away from work during breaks and free time in a productive and educational activity. Naturally, these breaks are quite brief, and therefore, most activities are far too long to fit these time slots. I began to grow very sick of simply staring at a web page, so I decided to go on a hunt, and locate some productive and fun ways to just kill a few minutes. 1. Sporcle - If you haven't visited this website, chances are you'll fall prey to its one-of-a-kind educational and competitive allure. Sporcle is an excellent way to spend a five-minute break, and you'll ALWAYS learn something from these fun and random quizzes! 2. Search for Things on Craigslist/eBay - I can't remember the last time a day went by where I didn't think of something I needed or wanted. It seems we are always shopping, and the truth is (sadly), we are! No one is immune to it, that's just part of the culture! Craigslist and eBay have a surfeit of cheap stuff, and you're almost guaranteed to find some impressive deals and fine merchandise. 3. Study Vocabulary - You'll be amazed at how useful an expansive and elaborate vocabulary is for nearly all facets of professional and social life. A strong vocabulary is an excellent attribute, and is sure to benefit you in more ways than you ever imagined possible. Take quizzes, make quizzes, or just browse through an online dictionary or thesaurus. 4. Create Your Own Website/Portfolio - This is useful to just about anyone, and can help spread the word about a product you're interested in propagating, or simply getting your name out there. Write a blog, upload interesting content, and show people why your website is awesome! 5. Keep a Journal - Have you ever read an autobiography? You can bet that most people who have written million-dollar autobiographies kept extensive and detailed journals outlining their experiences, ruminations etc etc. Yours could be next. If you're not interested in the fame, or are just uninterested in writing an autobiography, make your journal yours, and take some time to reflect on your experiences, feelings, and changes. It'll make you a better person, and you'll witness a remarkable change in your outlook on life. Here, I have included some of the best and most puzzling words I came upon in 2012...See how many you recognize, and as always, feel free to comment with your reactions and/or additions! As I begin what will undoubtedly be the busiest year of my life thus far, I've devoted a great deal of time and attention towards how I can make the most of my time, maximizing efficiency, and minimizing stress and wasted hours. The old "work until you can't" has been a reasonable solution up until now, but it's come to a point in life where quality is not only a contributing factor, it's an absolute necessity. Luckily, I believe I've devised a strategy that is applicable and beneficial to anyone; unfortunately, as you could have guessed, this will require a great deal of work, and an equal supply of stoicism. Here are some tips that I've found to be successful in completing the most work in your time, while maintaining a healthy and sane self, and producing quality work all the while. - Don't rely on your ballpark estimates, this one actually requires some time and practice. Go about your daily business, but pay specific attention to how long things take you, (such as meals, work, down time) and leave an additional window of time in case things trickle over a bit. - You might not think of exercise as a priority when your bills need to be paid, but trust me on this one, your body, like your brain, needs practice. This is coming from experience, experimenting my reactions and focus during work, subsequent to either exercising or not. During class and work in which I exercised earlier in the day, I was almost completely focused the entire time, and didn't feel restless and antsy. When not exercising, focus is still fine, but it requires far more self-discipline in order to achieve slightly less. 3. Finish What You Started! - I know it's tempting to jump from task to task, but it is ideal to finish the task you've undertaken as soon as possible. This is not to say you shouldn't prioritize, because in most cases, you'll have to prioritize. 1. Versace Eau Fraiche - This cologne is sweet, fresh and to the point. A long lasting citrus scent will have people hanging around you and sniffing all day long, and you'll find yourself being asked what you're wearing on a regular basis. 2. Acqua Di Gio - There's a reason this cologne is the best selling of all time. Enough said. 3. Dolce & Gabbana The One - D&G amalgamated some blend of tobacco and coriander to concoct this sophisticated and sharp fragrance, and whatever they did sure worked. This cologne is sure to entice and please the olfactory of whoever is nearby. 4. Yves St. Laurent Pour Homme - Another sophisticated and classy cologne, YSL is a bit pricey, but is great for special occasions and is a sure favorite with the ladies. Now that we're out of the era of pocket watches (well, most of us at least), it's fairly uncommon to find a man or woman without a wristwatch. Watches range from $1 or less, to upwards of $10,000 for a quality Breitling or Patek Philippe. Heck, some watches from Cartier or Piaget have even been known to sell for an exorbitant seven-figures. Okay, now that you have been made aware of the vast discrepancy between watches, you're options have just multiplied themselves by about a thousand. Allow me to narrow it down for you. First, it's up to you to decide what you want in your timepiece. Are you a business man looking for a sleek watch, are you a construction worker looking for something durable and impervious to the steel post you often scrape your watch against, or are you someone who wants to unite work and play with a fun, practical time-telling device. The beauty of watches is that you don't have to choose just one! You can have as many or as few as suits you, and if you ever change your mind, a good watch rarely goes out of style. To aid you in your decision, I've organized a set of top brands for various purposes. 1. Casio G-Shock - These watches are tough, affordable, and flashy. Sporting a casual look, G-Shocks are prevalent among the younger, more active crowd (mostly athletes), and are well-known for their large case design, vibrant colors, and functionality. 1. Movado - The classic Swiss-made watch has been around for over a century, and are the quintessence of sleek, elegant watches. No numerals, no numbers, no date--just a patented 12 o'clock dot. Most Movados fall in the $500 range, with a little bit of wiggle room on both ends. I've seen them for as low as $275, and have found that they generally don't cross into the four-digit range. One thing Movado did get right was the crystal face. Sapphire. Practically, this is definitely NOT the watch for you. But if you're looking to turn heads and finish off the smooth, clean look, Movado is a great choice. 2. 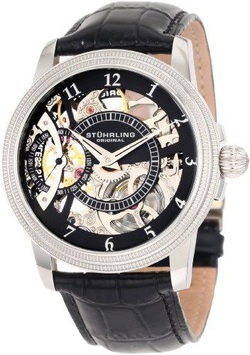 Stuhrling Original - Stuhrling is a brand rarely found in person, but ubiquitous in the online watch world. Stuhrling is certainly not the most well-known brand, but they have a huge number of watches for sale, and though MSRP they go for several hundred dollars, I've found them to be around $150 for a decent piece. These watches are a bit less conventional in their craftsmanship, but offer an appealing classic style with a modern touch. With a much more busy face, Stuhrling is pretty much the antithesis of the Movado, yet they both serve their purpose as elegant timepieces. 3. Tissot - Another Swiss watch, Tissot is known for luxurious functionality. Tissot is a tad more expensive than Movado, but promises to make up for its price with a number of different fun functions. If you have $1,000 to spend on a watch, and you're looking for one watch that does it all, search no further. The Tissot T-Touch offers a touch screen watch that includes a compass, thermometer, chronograph and even an altimeter. You can even check the weather on this watch, and the hands rotate counter-clockwise when bad weather is coming, and clockwise when the weather is improving. Pretty cool. 4. Bulova - Not exactly the top of the line for fun features, Bulova offers an elegant selection of watches for a reasonable price. A Caravelle, which is the bottom of the Bulova line will run you about $100, while the top of the line Accutron and Precisionist will fall closer to the $1,000 range. But, like all other things, you get what you pay for. The Caravelle is a functional and classy watch, but if you care for more accurate time, better quality materials, and an overall better watch, you ought to start saving up for that Accutron or Precisionist. Rotten Tomatoes...What Is Your Problem With "The Words"? I wasn't planning on writing anything regarding the recent film I saw with my father, but after seeing an 18% rating on RottenTomatoes, I felt obligated to support this movie, and refute the nasty RottenTomatoes rating. First off, let me say that although it was not the film of the decade, "The Words" was a creative and emotional production, with the added bonus of Jeremy Irons' impeccable performance as a grumpy old man stuck in his romantic, heart-breaking past. It's funny that RottenTomatoes gave this film an 18% rating, while the audience gave it a 51% rating, which leads me to believe that whoever is reviewing movies for RottenTomatoes needs to make some adjustments, and ease up on the harsh criticisms. All things considered, I don't think there could have been a better or more engaging rendition of a story based simply on a manuscript, but Brian Klugman managed to squeeze out 96 minutes from this fictional book, and did so with minimal superfluity. The story begins with a struggling writer (Rory Jansen), played by Bradley Cooper, who when honeymooning with his wife in Paris, happens upon an old briefcase, which he soon discovers contains a gut-wrenching manuscript of a man who lost his child, and the hardships accompanying the death of his newborn, and the separation from his wife. Rory then proceeds to type the story, visualizing himself being the actual author of these words, and before he knows it, the entire manuscript is typed, word for word, punctuation for punctuation, exactly as it appeared on the original. Jansen's wife then stumbles upon the document, and though Rory tries to confess, his attempts prove to be futile, and the next morning, per his wife's request, Rory shows the plagiarized document to an editor, who immediately publishes it, making Rory an instant hit, and giving him the publicity he needed to jumpstart his writing career. Meanwhile, the old man, played by Irons, watches Jansen, absorbed in the luxuries that should rightfully be his. But the old man isn't interested in revenge, he simply wants Jansen to know the truth, to feel the pain that accompanied that story which he wrongfully claimed the rights to. As all the pieces come together, there is a whole different perspective, taking place in the present as a middle-aged man steps up to a podium in front of an audience, reading the story from the perspective of an outsider looking in on the grand scheme of all that is happening. Jansen tries to recompense the old man, confessing to him, as well as the editor and his wife, but it is simply too late, and the old man doesn't care for the money or pity of the ignorant Jansen. A few weeks later, the old man passes away, taking the secret with him, and leaving Rory guilt-ridden for the remainder of his life. At the conclusion of the movie, all the scattered pieces come together, as we realize that Jansesn is in fact the story teller who is conducting the reading, and has publicly confessed through his newest book, and truly felt the pain of the old man, as he lives a single man, whose wife has left him, yet his heart remains committe, though she has long since moved on. The Doping Epidemic - Has Drug Abuse in Sports Gotten Out of Hand? Barry Bonds, Mark McGwire, Sammy Sosa, Manny Ramirez and recently, Bartolo Colon have been among the many professional athletes to test positive for steroid use. To be quite honest, it always bothered me, but I never got too down about it, probably because I didn't connect with "America's past-time" the way other kids did. But that all changed tonight, and if word hasn't spread quickly, prepare to be disappointed, dejected, and let down. After raccusations from the U.S. Anti-Doping Agency, Lance Armstrong, that's right, our Livestrong hero Lance Armstrong, decided that he wouldn't fight charges that could potentially strip him of 7 Tour de France Titles. But why Lance? Why not just deny the use, and rest on your laurels of previous drug tests you consistently passed? In an interview with the Huffington Post, Armstrong claimed he wouldn't fight the charges made against him because he was tired of the "nonsense." Sadly, this would lead all of us to believe only one thing--he was on steroids. But don't throw away those Livestrong bracelets too quickly. In addition to being extremely confident in his victories being legitimate, Armstrong also added that he would ignore accusations against him, and was getting back to his original philanthropy of helping cancer patients. What's my opinion? Well, I don't want to be like the USADA and assume just because he didn't fight it that he was doped up from 1999-2005. On the other hand, I am skeptical and somewhat puzzled at the fact that he didn't just dismiss the assertions made against him. Perhaps he was on steroids at some point during the seven-year span, though as a sentimental person and a fellow athlete, I believe Lance, and wouldn't peg him as the type of person to weasel his way to the top via steroidal shortcuts. Besides which, had he not won, perhaps a fellow teammate of his who had openly admitted steroid use would have won. And what would we say then? Nothing. I'd be interested in knowing just how many professional athletes are on steroids, but ione thing is certain, it's far too many. What ever happened to wholesome old sports? Gone. Today's era consists of a win or go home mentality, and if winning requires steroids, so be it. Personally, I've never tried steroids, though I'd wager winning with the aid of steroids sure beats the hell out of losing without them. The USADA seems to have gotten carried away with their accusations, and I'm not sure that you can win without being barraged with a slew of vicious accusations that you're a juiced-up steroid machine. In this case, it seems like everyone is doing wrong, as the USADA has jumped to conclusions with no real trial and testimony, and Armstrong had to uphold his pride by choosing not to fight the so-called "nonsense." As to how the problem of performance-enhancing drugs, I don't see any viable solution, though at this point it might benefit everyone to just legalize the use of anabolic steroids and dazzle the world with a plethora of broken records and super-human athletic performances. (Just kidding, though I'd like to see what Usain Bolt and Michael Phelps would be able to do with a little steroidal assistance). The other day, I had the displeasure of experiencing the negative side of cars--when they don't run smoothly, and fail to get your from point A to point B. I'm not any kind of driving enthusiast, so when I can I try to avoid driving long distances unless absolutely necessary. After an enjoyable day off spent at the Carousel Mall in Syracuse, NY, it was time to get back to camp (a 90 mile drive), and get some sleep. Evidently, that wasn't in God's plans, and it certainly wasn't in the '03 Subaru Legacy's plans. After about 3 miles, the 'Old Lady' began to overheat. Assuming that it was just a result of my foot sleeping on the gas pedal as the car tried to ascend the mountainous road, I continued to drive, waiting impatiently for the temperature to drop back down. At this point, there was no more hill, no more foot on the gas, but the temperature continued to rise. With my oh-so-extensive knowledge of cars, I realized that the air-conditioning was now blowing hot air, and that the engine was overheating--time to pull over. Ordinarily, I would just have locked the car, grabbed my bag, and been on my way via the most reliable form of transportation (which is of course, one's legs), but being as I was not alone, I called to have the car checked out and played the waiting game. As any teenager in a sticky situation might do, I called my father, knowing that he would be able to point me in the right direction, and at the least to inform him of my whereabouts. Following my newly acquired advice, I called the camp, at which point I was directed to the security guard, who coincidentally and very fortunately for us, had a generous friend who was willing to help. Now, and only now, was there a chance that we would be getting any sleep that night, and possibly getting on our way within the next 24 hours. When help arrived, it wasn't just an aid for the car. A man whose name will remain withheld provided us not only with reassurance, but also with entertainment and kindess above and beyond anything I've ever witnessed before. A person whom none of us had ever met or even heard of prior to that night was now offering us a ride, a place to stay and a helping hand during a time of incertitude and confusion. Next, we waited for the car to be towed to the car shop. The tow truck came in a miraculous hour in change, which for Triple-A is practically code-red emergency speed. The rest of the night wasn't quite so eventful, but it did teach me a few surprising things. First, you never know who might come to the rescue during your time of need (you might find that they are unlikely characters, and perhaps even friendly strangers). Second, don't go too far from home if your car is overheating, just go get it checked! And lastly, always know and trust your mechanic. Oh, and I forgot to add in conjunction to that third lesson learned that we actually did have the car inspected that morning, informing the mechanics that the car had been overheating, and though they claimed to fix the problem with some coolant, it may have exacerbated the problem, causing it to go from a hot engine to a cinema-like death trap, with smoke and steam erupting from under the hood. Just so no one feels like they didn't receive a proper conclusion to our little escapade, we managed to get the car fixed (properly--thanks GoodYear), and were able to get home in due time. And for all who were concerned about the 'Old Lady', she too is running fine, and intends to accompany and guide us through our next journey. The struggle to locate the perfect car continues, and my father remains torn between the choice of fun and fuel efficiency. From "fun side", we have the Scion tC; a fun, sporty two-door car that has some pickup and hugs the road on those tight, windy mountainous roads. In terms of pricing, the Scion is very affordable, with the starting price right around $19,000. This car has almost everything you could want, and is definitely the more fun option, and the cheaper option, though in terms of futuristic feel and technological power, it isn't anything worth gaping over. Graduate student, writer, insurance producer, runner.